1. An iPhone 4s and iPhone 5. I don’t know how anyone can survive without an iPhone anymore. I get heart palpitations when my hand doesn’t connect with phone at the bottom of my handbag. We use our phones mostly for entertainment and music but I can imagine that it will come in handy when travelling. Apps like Google maps and the XE currency converter have already been useful in the planning stages of the trip. Instagram remains my favourite and most used app and has even overtaken Facebook. I really like scrolling through #nepal and #thailand and seeing peoples pictures. I love seeing how people compose interesting Instagram pictures and have stored away many an idea or piece of inspiration. I mentioned a great article with tips for taking amazing travel photos in this post. 2. A MacBook Air 11’ inch. We were happy to get this second hand through Gumtree for only $600 which we thought was a great deal. This cheeky little computer is so small and so light, it really is the ideal laptop for travelling. The only downfall of this model is that it doesn’t have a disk drive so watching bootleg movies is not going to be an option. 3. A Sony NEX 3N. The smallest SLR on the market at the moment, this camera is great. We are a little over our heads with the manual settings but hopefully we can make the leap off auto sometime in the future with a little practice. The camera has a flip screen which is great for self portraits and for filming videos as you can make sure you are actually in the shot. This feature is handy if you are travelling solo or in a couple because there is nothing worse than a couple of hundred shots that cut off the side of your head. If anything, these things are super fun to fiddle with. Basically Gorilla Pods are small tripods made with connecting grippy balls. This means you can manoeuvre the legs into any different position and even use the legs to wrap around a tree or a railing for extra support. Again a great little thing to have if you are travelling solo or in a pair because you can wrap it around a nearby surface, put the camera on a timer and Voila! you can have the whole scene in the shot. These are a pretty affordable price and you can fold them down small to save space. What can be said about the GoPro that hasn’t been said before. This little camera is simply amazing. Ours has already had a few swims and it performs amazingly underwater. The wide-angle lens is great for capturing experiences. The only downfall is the battery life. Ours drained so quickly we thought it might be faulty, but turns out they do only last a couple of hours. We are very excited to use it in our free diving and scuba diving adventures. Also great for those dirtier adventures where you don’t want to worry about breaking your fancier camera. 6. GoPro Evo Pole- Transparent extension pole. A very cool purchase that I gifted to Chris on his birthday. The pole is 26 inches long and is completely waterproof, durable, and is used as an extension for the GoPro. It lets you get wider shots which is handy for capturing sweeping scenes. It has a grippy end which you hold in your hand and its great for taking video of yourself as you can usually get your whole body and the scenery in the shot. Im excited to take this one paragliding in Nepal. Hopefully it remains firmly in my hand and not plummeting towards the earth. An obligatory hard drive to store photos and videos collected along the trip. This baby will also store a small collection of movies to be watched on long train journeys and rainy days. 8. Urbanears Plattan headphones in Indigo. My first pair of these were stolen in what came to be known as ‘The Most Inconvenient Thievery of All Time”. Although the loss of headphones was annoying, the thief managed to steal the cover of my sleeping bag. A sleeping bag bought solely on the merit that it folded up teensy, tiny to fit in the specially made bag. Mind you, the thief left the sleeping bag but having no bag to stuff it into, it may as well have been a down-quilt. Anyways.. these headphones don’t match up to the sound quality of Bose and Sennheiser, but they fold up small and are in array of cute colours. 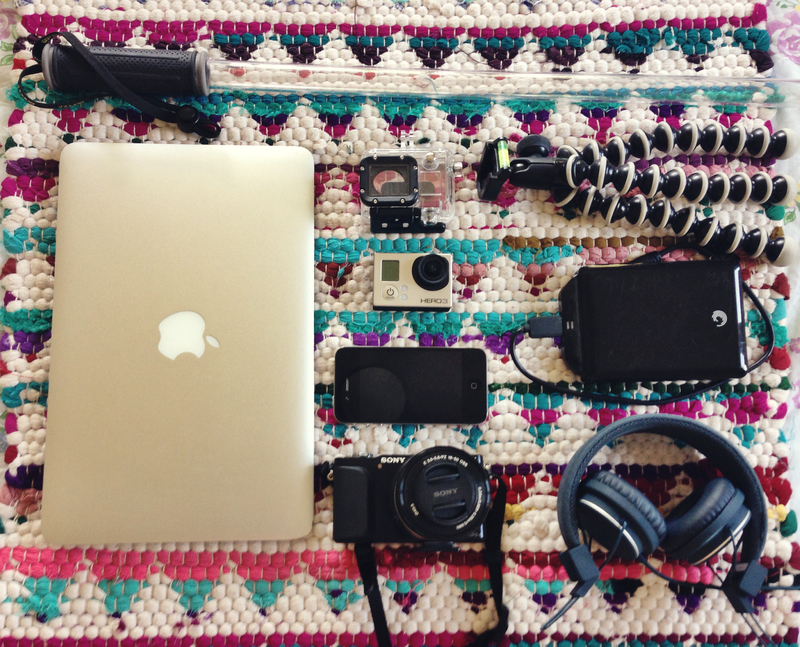 A wrist and chest strap for the GoPro, a pair of headphones for Chris and some tiny travel speakers. Do you have any technical recommendations for our trip? What did you use most? Leave us a comment below or email us at dirtypawsblog@gmail.com.